“It’s one of those ancient arguments, like a black guy can’t be a quarterback or a woman can’t fly a plane,” Jeff “Tain” Watts tells Shaun Brady in this month’s Chops piece. He’s referring to those worthless stereotypes about how drummers can’t be effective composers or songwriters—an extension of a larger trope that views drummers as timekeeping musical furniture, necessary but nonintellectual. This is, of course, a gross untruth across genres. (Take Charlie Watts out of the Stones and tell me what’s left.) But in jazz, where drummers have constituted a large chunk of the most important writers, conceptualists, mentors, bandleaders and soloists, it’s especially preposterous, and I’m reminded of that fact every fall as I edit this drum-focused issue. 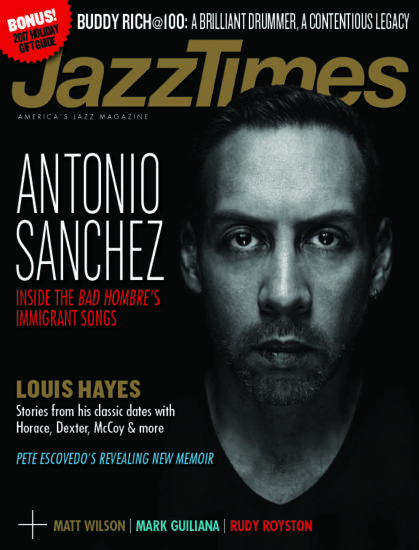 In the cover story, Geoffrey Himes talks to Antonio Sanchez about his boldly experimental and political new album, Bad Hombre (CAM Jazz). Fusing his affinity for electronica with the improvisational scoring method he refined during his work on the film Birdman, Sanchez takes a rhythm-first approach to protest, pushing back against President Trump’s immigration stance. Guided by our Aidan Levy in this installment of Bright Moments, Louis Hayes remembers the sessions behind his most historic LPs, in the process detailing the development of hard bop and soul-jazz. Andrew Gilbert, in a fantastic piece split between reportage and critical rumination, considers the legacy of Buddy Rich on the occasion of his centennial. The subtext here is huge, bringing up questions about how the drummer’s role has evolved in jazz and the jazz musician’s function has devolved in pop culture. The Before & After listening session with Mark Guiliana, conducted by Ashley Kahn in Belgium, features thoughtful consideration of everything from progressive acoustic jazz and fusion to dub and electronica. (In a fascinating way, it works as an unpacking of Guiliana’s own singularly inclusive music.) Mike Clark, in a revealing Overdue Ovation profile by Ted Panken, explains how his association with the Headhunters has been both a blessing and a curse for this versatile but bop-centered musician. Through an Artist’s Choice column detailing the melodic, harmonic and textural dimensions of great cymbal playing, Rudy Royston proves how completely a drummer can influence an ensemble’s sound. And there’s more for Stateside readers. 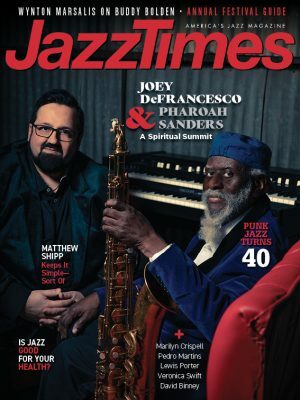 This issue also includes our annual Jazz Education Guide—which, with in-depth features on Geri Allen and Mick Goodrick and a terrific survey of traditional-jazz instruction in New Orleans, shouldn’t be passed over by our non-musician subscribers. (If you’re reading in Canada or international territories, look for those features online.) Enjoy the issue.